Dairygold, Ireland’s largest farmer owned dairy Co-Operative, has reported a solid financial performance for 2016, against a backdrop of very weak returns from international dairy markets, especially in the first half of the year. Dairygold Annual Results 2016: Dairygold recorded turnover of €756.1 million (2015: €784.9 million), delivering an EBITDA of €39.0 million (2015: €41.2 million). The farmer owned Co-Operative achieved an operating profit of €17.5 million, (2015: €19.2 million), while increasing Milk Price support to its Members to circa €25 million, up from €20 million in 2015. At year end the net asset value of the business was €307.6 million (2015: €315.5 million), while bank debt was reduced by €7.5 million to a prudent €88.7 million. 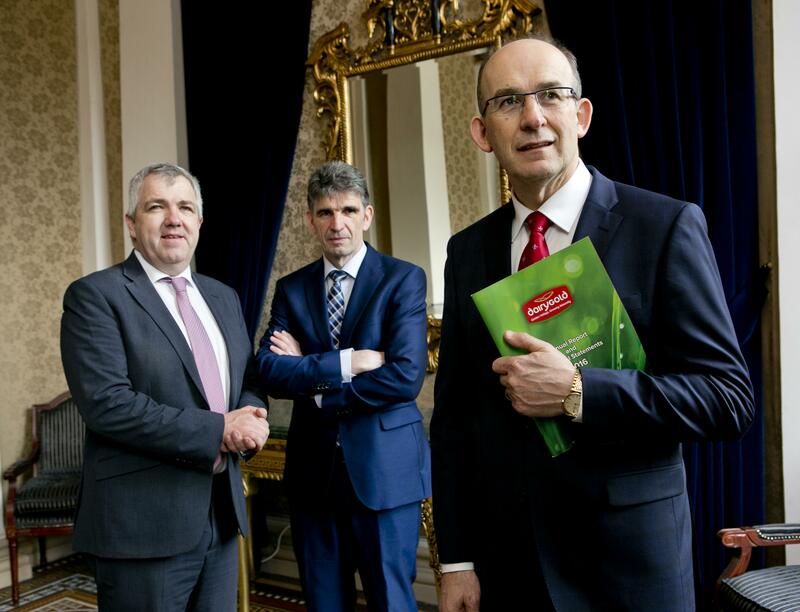 Dairygold continued its ambitious capital programme during the year, investing a further €15 million in the business, bringing the total capital investment over the past six years to €200 million. This investment established a state of the art sustainable milk processing platform, across dairy sites at Mallow and Mitchelstown. The investment has increased processing capacity by 55% enabling farmer Members to fulfil their on-farm growth ambition but more importantly the business can now leverage its investments in infrastructure to progress value added commercial opportunities. Dairygold also strengthened its track record in building strong commercial partnerships with global food companies with the announcement of the planned development of the new Jarlsberg® Cheese production facility in partnership with Norway’s largest dairy processor Tine SA. This will quadruple the current Jarlsberg® Cheese production in Mogeely. However, while overall import figures for the major dairy importing countries did recover and 2016 ended with a positive outlook for Milk Price, concern remains in relation to the overhang of dairy stocks, and milk powders in particular. Dairygold responded to this improvement in market conditions with immediate milk price increases, according to Dairygold Chairman James Lynch. “From July 2016 onwards Dairygold implemented seven milk price increases in anticipation of continuing improvement in market returns. Dairygold also ensured that support was made available to our grain suppliers against the impact of the ongoing depressed international grain market following a difficult harvest. In addition, Dairygold negotiated lower cost loans and credit facilities for members with both AIB and Bank of Ireland. The post quota milk production expansion across the Dairygold catchment area has exceeded original forecasts with the Society witnessing a 24% increase in milk volumes for 2016 at 1.2 billion litres when compared to 2014, the last full year of quota restrictions and a 44% increase on the Harvest 2020 (Government Strategic Plan) base year of 2009. Dairygold Milk Supplier Forecasts are that by 2020, Milk Supply will be approaching 1.5 billion litres per annum. While welcoming the generally more positive global market conditions for dairying Jim Woulfe pointed to external factors which will present significant challenges in the period ahead.